:We live in the hope of experiencing first-hand the all-sufficient grace, love and forgiveness which is God's alone, a hope that we may know with our heads long before we feel it in our hearts. This book is centred on a hope that means encountering God not only as consoling presence in the darkness but as one who challenges us to respond to his call. That call may prove to be costly, but as we respond, we will find ourselves transformed as we discover and rediscover not only that we are known exactly as we are, but loved beyond understanding as God's precious children.In a series of Bible reflections - and some poems - the theme of this hope is explored in different ways, from the yearning of the Psalmist to walking the gentle journey of the Good Shepherd's leading. 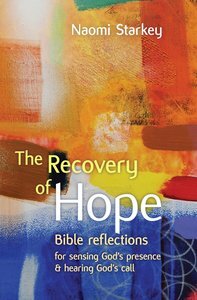 About "The Recovery of Hope"
Naomi Starkey is BRF's Commissioning Editor for the adult list, and editor of and contributor to New Daylight Bible reading notes and Quiet Spaces prayer and spirituality journal. She has written articles and reviews for a wide range of Christian publications plus two science fiction novels. She is married to Mike and they have three children.